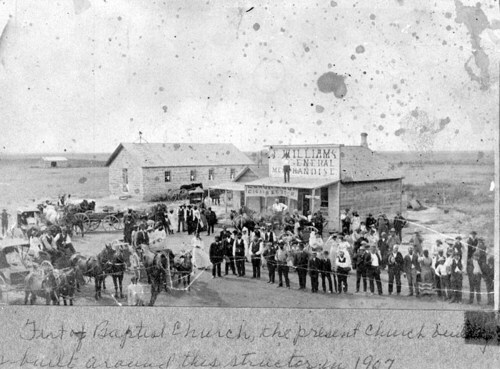 This photograph captures the bustling main street in Nicodemus, Graham County, a settlement founded by Exodusters in 1877. It includes a number of townspeople and the Williams Mercantile store. The building on the far left is believed to be the First Baptist Church. The new First Baptist Church was built in 1907 around this church; once the new building was completed, Nicodemus residents demolished the original church. The new building is now part of the National Parks Service historic site. This works in tandem with sources about the Exodusters' experiences once settled in Kansas and with documents concerning Nicodemus, including the certification of incorporation, articles from the Nicodemus Western Cyclone, census data, and the advertisements for the colony. In addition, it could be used to provide background before a field trip to the National Parks Service site. Curriculum - The Kansas Journey - Chapter 6: Welcome to Kansas: "Her Light Shall Shine"